Our first international stop on our trip was the city of Johannesburg, a.ka. Joburg, a.k.a. Jozi, a.k.a. The City of Gold. 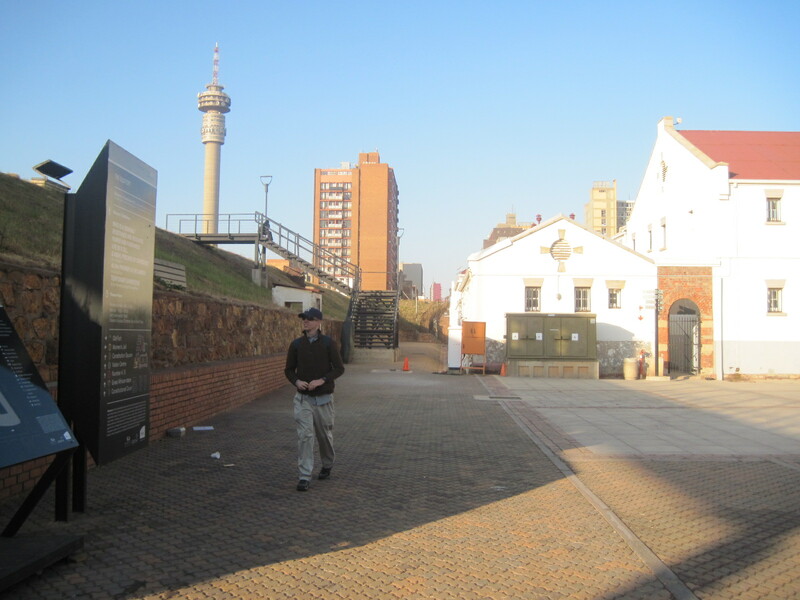 Joburg has a mixed reputation as a tourist destination, but we found it a fascinating place with lots of history. As we learned more about Joburg, we were interested to discover that in many ways it is similar to Denver! Joburg was a small farming area that exploded into a boomtown in 1886 once a giant gold deposit was discovered – similar to Denver’s origins. Denver did, at least, have a water source near the city core, whereas there is none near Joburg (the water is piped in from the mountains of Lesotho). Also, the elevation of Joburg is over 5700ft – so if Denver is the Mile High City then Joburg must be the More Than a Mile High City! Johannesburg Backpackers – The first two nights in town we stayed at this basic backpackers hostel in one of the northern suburbs. We chose this location because this part of town is considered safer. Our double room was nice and spacious with its own bathroom. The downside of it was that it had no heat (and it is winter here, with nights dipping into the 40s), but they did provide plenty of blankets. Another downside is that there isn’t much to do around the area. There is an area of bars and restaurants called Greenside a few blocks away, but it is still considered a little sketchy so you aren’t supposed to walk back from there too late at night by yourself. Also, to get to any attractions requires you to use a taxi that they will help you set up. 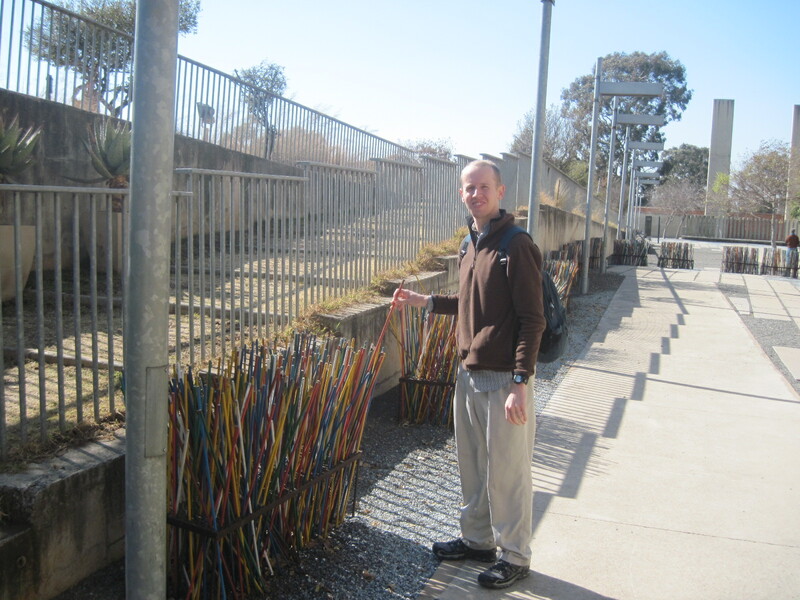 Lebo’s Soweto Backpackers – The second two nights we transferred to the Soweto area. This township has a rich history as the location where blacks were forcibly transferred to in order to get them away from the city center, and then as the center of apartheid resistance. These days it is a friendly, gigantic suburb. The hostel is a nice and vibrant accommodation – there is a kitchen that serves all three meals for a reasonable fee daily. There is a nice patio area outside with a self-serve honor system bar, reggae music playing, and campfires in the evening. Our double room is small but comfy, and we used a shared bathroom across a breezeway. This is one of those bright red double decker bus tours that you see in a variety of cities around the world which allow you to hop on and off at different stops along the way. 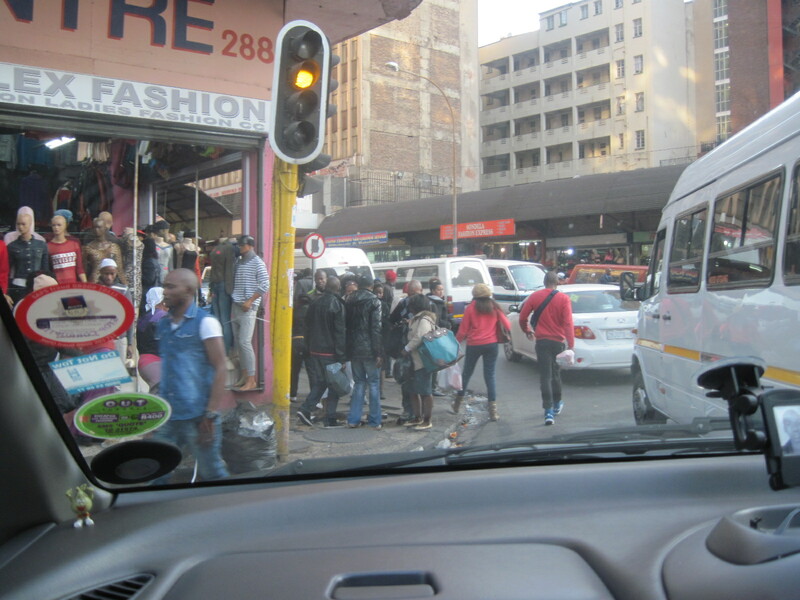 Normally this would be too high on the “typical tourist” scale for us to really consider, but it seemed like the best way to see the sights in downtown Joburg in one day since it is not very walkable. The tour starts at Park Station downtown and winds through the Central Business District. They give you headphones to plug in and listen to a narration of what we are seeing. We drove by, but did not get off at, various sights like Gandhi Square (Gandhi lived in South Africa in the early 1900s) and the Carlton Center, one of the tallest buildings in all of Africa. We got off at the Apartheid Museum (which I’ll describe later) and spent multiple hours there, limiting our ability to stop at too many other places. We did get off at the Mining District, where we spent 30 minutes walking through some outdoor exhibits about mining and Joburg history. We also saw Mandela’s first law office here. We also got off at Constitution Hill, where we walked around the outside of the Constitutional Court, which was established in 1994 when the new constitution was written. We also walked around the ramparts surrounded an old fort/jail and provided a 360 degree view of the city. We missed out on the Newtown area, specifically the SAB Miller “World of Beer” museum. Maybe next time! After we got off the bus, our taxi had to detour back into the CBD to pick up another hostel guest. This allowed us to see the packed street scene of markets, local taxis and lots of people. And the driver said this was a light crowd since it was a Saturday! As mentioned previously, we spent the majority of our day at the Apartheid Museum. And even then we felt like we had to rush through! There is quite a bit of history to learn here. The museum started with the beginnings of Joburg as a mining town, and then went through the first attempts at segregation to the implementation of the full-fledged apartheid system in the 1940s. Then, there were displays about the realities of living under apartheid, and the first wave of resistance that led to Mandela being sentenced to life imprisonment. Then, as we went chronologically. We got into the student uprisings of the 70s. For the 1980s, there was a gripping video detailing the horrific violence that brought the apartheid movement to its breaking point. We then moved on to the 90s, which detailed Mandela’s release, then end of apartheid and the founding of the new government (and also showed how close the country came to total anarchy at the time). 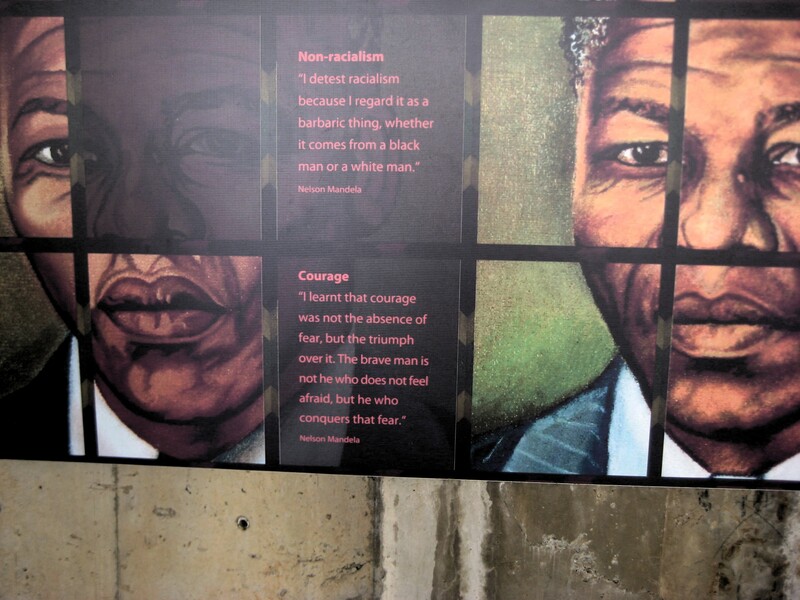 In addition to the history of apartheid, the museum also had a large exhibit on the life of Nelson Mandela. We spent quite a bit of time going through this. At the end, you were invited to choose your favorite quote of his and then place a stick of the corresponding color in a garden area. By the end, we were overwhelmed by how much had happened – and within our lifetimes too. It is interesting to compare the racial strife in South Africa to that in the USA. Different types of issues, but still the underlying core of people in power doing horrible things to those without power. It is amazing to think about all that has gone in here in South Africa so recently, and how happy many of the people seem. But there are still many problems left to face. Thai Restaurant – We arrived into Joburg early in the morning on July 4, and were pretty tired after two overnight flights in a row plus the time zone change. Still, we worked up to energy to meet up with a friend of a friend who lives here in Joburg. She was kind enough to drive us around to show us some sights and then take us to a Thai restaurant that was quite good. Doppio Zero – After our city bus tour, we had the tax driver drop us off at the Greenside restaurant area for dinner. The hostel guest we were sharing the taxi with was going to this Italian bistro because she knew it had free wi-fi, so we decided to join here. We had some nice pasta dishes while we caught up on email and facebook on our phones. hmm, the joburg architecture isn’t what I would have expected but still seems like it was a really interesting visit. A Holocaust museum I went had a similar “choose who you are” feature , and I thought it was really well done. Hope you are hanging out (Safely) with wild animals!